The perfect start to 2019 is here at Aloha Active Noosa!!! 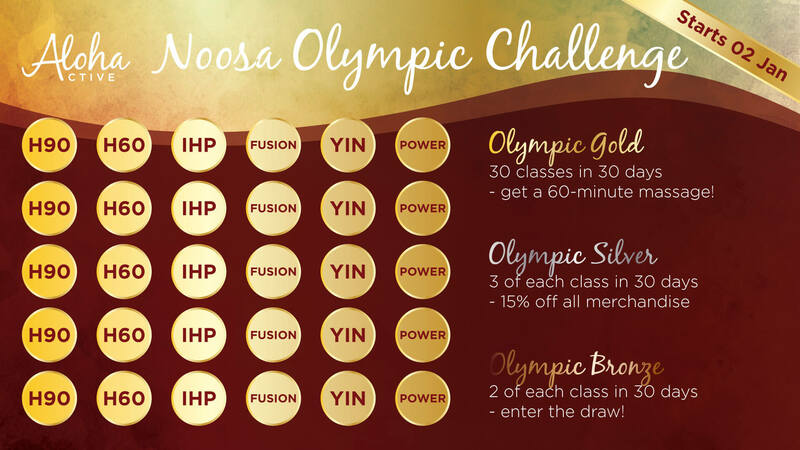 The Noosa Olympic Challenge is a great way to detox from the holiday season and get your mind and body in tip-top shape for the year ahead. Start at any time from the 2nd of January onwards. Simply grab an entry flyer from the front desk, write your name and the date on it and stick it up on the wall. Your personal challenge ends 30 days from your start date. Mark off the classes with the date as you attend them. The challenge ends Sunday 31st March, so there’s plenty of time to start! Complete 2 of each class over 30 days and go into the draw. Complete 3 of each class over 30 days and get 15% off all store merchandise. Complete 5 of each class over 30 days and get a 60-minute relaxation massage. Note: to be eligible you must complete each of the different classes: Bikram 90 Minutes, Bikram 60 Minutes, Inferno Hot Pilates, Aloha Fusion, Yin Meditation and Power Yoga.